During the depression years a travelling salesman came to my grandmother's house with an Infant of Prague statue which my grandmother purchased. My two uncles who were then small children came to the door. The salesman told my uncles to say three Hail Marys every day in honour of the Infant of Prague and to ask the Infant Jesus of Prague to send them a few lollies every day. This sounded like a great offer because they rarely had any lollies during the depression. They followed his advice and a rich husband and wife purchased the hotel up the road. The wife called my uncles to the fence and gave them three lollies every day. A small incident which had a big influence on the development of our family devotion to The Holy Infant Jesus of Prague was when my mother won an Infant of Prague Statue in a competition in Kindergarten. She turned frequently to The Infant of Prague from then on in her needs and she still does. Her devotion has influenced myself and also my brothers and sisters and through us our children. On one occasion when we were children, my mother was quite short of money to pay pressing medical bills. She prayed to The Holy Infant Jesus of Prague and a few hours later a man knocked at our door and asked if he could buy some of the building wood which he saw in our yard. Mum had no real need for the wood so she sold it and the sale provided money to help pay the bills. A friend came down from Sydney to visit me and we discussed many things and then we said a prayer to the Infant of Prague. The prayer among other items asked the Infant of Prague to protect and bless our temporal goods from loss and misfortune. Sometime during my friend's visit my next door neighbour's house was broken into. Their house was robbed of many valuable items. Our house was spared this treatment on that occasion and my friend and I attributed this to the Infant of Prague. (Every house on the block had been robbed at some time and one of them was robbed twice, even the primary school across the road was robbed. We were never subjected to this.) I prayed the Infant of Prague chaplet regularly. On another occasion when I had just finished saying the Infant of Prague Chaplet, my son went down to the back shed and sat on a old upholstered swivel chair which was marked for the tip. He put his hand up inside the material which surrounded the arm of the chair and pulled out a $20 note. We were very surprised and then my daughter told us that her nana (my husband's mother who had lived with us until about the time of her death), had sometimes put money notes up the arm of the chair for what she probably thought was safe - keeping. She must have forgotten to remove this one. Our family have received many other kinds of favours that are quite different from the ones out lined on the previous page. Some of the favours are to do with health, others are connected with catechetical work and many other kinds of needs and problems. The following favours are in relation to friends of mine. There are also some comments made by people on the Infant of Prague devotion. A young widow lent her friend about $3,000 to put down a deposit on a house. She promised to pay it back by a certain date. It was most important that she do so because the widowed lady needed it back to pay off some off her husband's funeral expenses. Unfortunately the due date passed and the money was not payed back The lady who had borrowed the money went out of her way to avoid meeting up with the widow. The widow went to Singapore to visit some relatives and wrote back to Australia to her friend pleading with her to pay back the money. The letter was totally ignored. The situation dragged on. Another friend of the widow said that she would say an Infant of Prague eight hour novena to help the lady find a solution to the problem. The next time that this friend went to see the widow before she could say that she had completed the novena, the widow said to her "I know that you have made the novena, about half of the debt has been paid back and the lady has promised to pay back the rest of the money in instalments as soon as she can....."
A friend told me the following story: she was one of 11 children of a widowed mother. Her mother was hard - pressed to feed and clothe the family and to pay the bills. On one occasion when there was no money left to meet their needs, her mother prayed The Infant of Prague Chaplet and then she swept the rooms in her house. Some money was found under the carpet to meet their immediate needs. Another lady related the following details to me some years ago.She had been suffering for some time from a serious problem with her leg (the exact nature of the problem I cannot now recall, however I think that it may have be pain). She prayed constantly about this to the Holy Infant of Prague. One night she felt a young child's hand rubbing her troublesome leg. There was no one in the room with her. From then on her leg was fine and there was no more trouble. The lady showed her gratitude to The Holy Infant of Prague by giving out many leaflets on the devotion. A lady who was giving me a copy of the eight hour novena in my former parish commented to me about this devotion: " It would take a whole week to begin to tell you the answers to prayer in connection with this particular novena". It is also known as the "The storm novena" because the person is "storming heaven" with their prayers. Another name it is known by is the "emergency novena". It is also known as the "Flying Novena". As a matter of interest there is another novena which is called "The Storm Novena". It consists of visiting the Blessed Sacrament nine times in the one day and praying there on your knees with your arms outstretched to pray for your petitions. You can choose any prayers that you like to say at these visits. 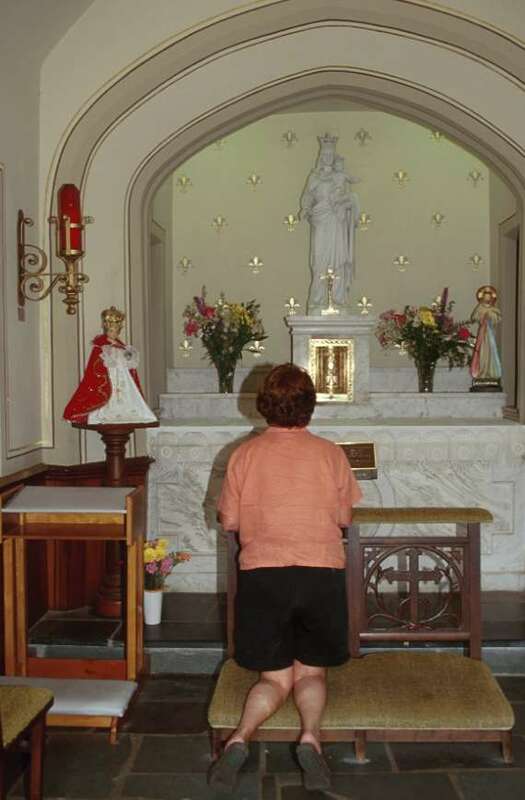 (Some suggestions of mine are any novena prayers to saints or to Our Lady, or some Our Fathers, Hail Marys and Glorias, or a decade of the Rosary at each visit). Anyway just choose the prayers that you wish to say and tell Our Lord the favours that you are asking Him for. You always make a fervent Act of Contrition at the first of the nine visits. Full information on this particular novena and its history can be found in a little book entitled "The Storm Novena" It is written by a Capuchin Father of St. Benedict the Moor Mission. A search of the internet can locate for you places where this book is sold. I promise you that you will find the history of this novena very interesting. It is a novena with a reputation of "delivering the goods" in other words obtaining favours from Our Lord. A Volunteer helper in a Catholic library told me that her sister prays regularly to the Holy Infant Jesus of Prague and that her sister never ran in financial troubles and always did well in this area. The librarian's comments bear out the prophecy of Princess Polyxena to the Carmelites of Prague. "As long as you honour the Child Jesus you shall never be in need". Don't forget to bookmark this page so that you can return to it later on. Take a look at the home page. It has many links to web pages inside this web site that have wonderful accounts of the miraculous intercession of saints and angels, a prayer petition page, information on sacramentals and prayers to saints, and instructional articles on Catholic issues written by a priest, which are suitable for those teaching the Catholic Faith. There are also special learning pages for children with autism and mental retardation. The reading lessons would be particularly useful to any parent of a small child, even if they are not learning disabled and there is also a housekeeping hints page. There is a music lesson page which is useful for mothers who have had absolutely no training in music at all, but still wish to teach their babies to play basic tunes on a musical keyboard. This is not a full list of what is available. There are also links to Catholic apostolates that will be beneficial to you. If you have enjoyed this website please recommend it to your family and friends.